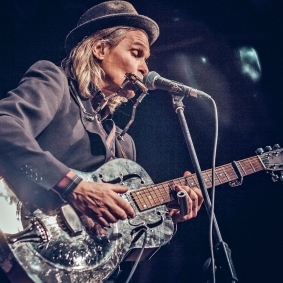 Robert Lighthouse, a native of Sweden, first came to the United States at the age of 18, determined to learn more about the music he loves - Mississippi Delta Blues. For eight years he traveled around the country visiting blues Meccas like Chicago's famed Maxwell Street and New Orleans, the cradle of the blues. He settled in Washington, DC in 1988 and established a cult following as a street musician. He toured Belgium and Holland with the Charlie Sayles Band and then landed his own steady gig at City Blues Cafe in D.C.
Robert has represented the DC area at the Blues Foundation IBC's twice, once with his band and once as a solo. His critically acclaimed debut CD, Drive-Thru Love, was released in 1998. His long awaited follow up Deep Down in the Mud was released in the summer of 2007 and also has received much critical acclaim. Robert's simultaneous work on guitar and harmonica on has received rave reviews in major blues publications throughout the United States, Europe and Australia. He has been called the second coming of the late Dr. Ross.